REVIEW: PLASTIQ.COM - Pay for Anything/Everything with Your Credit Card — Future Proof M.D. 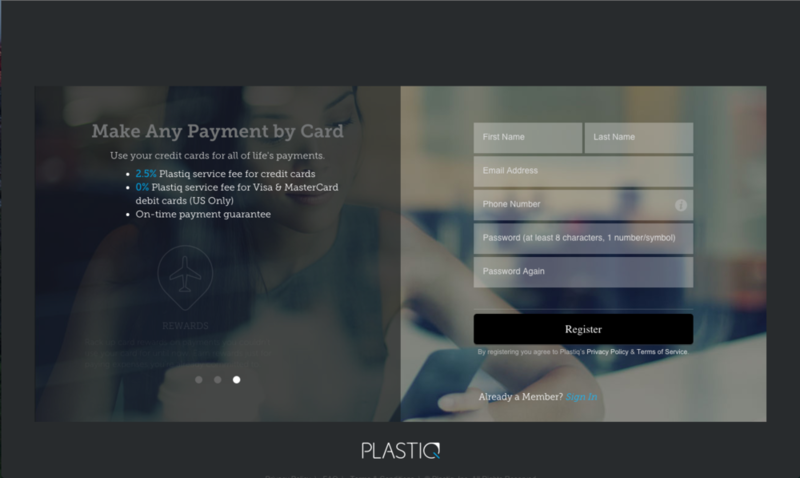 Plastiq.com operates like any other electronic wallet service: you create an account, add your payment sources (credit or debit card), tell them who you want to pay, and schedule your payments. Plastiq charges a 2.5% fee for payments originating from a credit card, 0% for payments originating from a debit card. Easy-to-understand business model - 2.5% fee when you pay with a credit card. 0% fee when you pay with a debit card. Payment tracking - you can see when your payment is charged, sent and completed. On time payment guarantee - Plastiq will pay for your late fee if the payment is late for any reason. 2.5% fee, while low, is still 2.5% additional tacked onto your bill! Discover cards are not currently supported. Many payment types to yourself, friends or family are not allowed. So no padding your IRAs with credit cards. Plastiq.com lets you pay for almost anything/everything with a credit card. But the 2.5% fee, however small, is not something I can advocate for. There are really only 3 scenarios you should consider using Plastiq.com. If your credit card rewards will offset the fee enough for it to be worth the convenience. For example, Plastiq ran a promotional rate of 1.5% on all Mastercard payments over $500 late 2015. In that case, using the Citi Doublecash card (2% cashback on every purchase) would have made you 0.5% on every Plastiq payment. If your payee only accepts mailed payments, assuming you have to pay for the stamp ($0.49) and envelope ($0.15), as long as the payment total is under $0.64 ÷ 2.5% = $25.60, it would make sense to use Plastiq. There is no fee if you pay using a debit card. But your bank likely offers free online bill pay services and it may be easier to bypass Plastiq as the middle man.